The Punisher was different...a Vietnam veteran who decided to bring his own form of justice to the Marvel Universe. Contrast him with Nick Fury - a WW II veteran who worked for the government after he left the military. During the early Bronze Age (comics from~1970 to 1985) we start to see the '60's back lash' in comics - Luke Cage is another good example - characters that question the very social institutions that were starting to lead us down the path to Watergate. This book is a Bronze "super-key" that all Marvel fans should read. 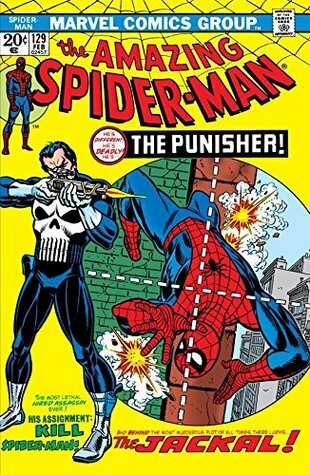 First appearance of The Punisher...teamed with some idiot named the Jackal. Decent enough interactions and Frank sees that Spidey isn't a murderer, so they part, with very little info on him other than he was a marine. Also feat. MJ, Harry, JJJ, Robbie, Betty. Gerry Conway Ross Andru Gil Kane - Comic-books writer.